​HM Manufacturing Beam Couplings are a class of coupling called Information Transmitting Couplings - These zero backlash, high torsional rigidity couplings are for precision positioning applications where constant velocity is required for accurate feedback control. Torque Range: 5 in.-oz.-7,200 in.-oz. Range of Max. Para. Misalign. : .004" to .038"
HM Manufacturing Bellows Couplings are a class of coupling called Information Transmitting Couplings - These zero backlash, high torsional rigidity couplings are for precision positioning applications where constant velocity is required for accurate feedback control. Torque Range: 40 in.-oz.-175 in.-oz. Range of Max. Para. Misalign. : .012" to .027"
HM Manufacturing Spider Couplings are a class of coupling called Shock Absorbing Couplings - As a result of flexible plastic members connecting their hubs, these couplings dampen vibrations and shock loads and electrically insulate shafting. Torque Range: 42 in.-oz.-3520 in.-oz. Range of Max. Para. Misalign. : .031" to .078"
HM Manufacturing Absorbathane Couplings are a class of coupling called Shock Absorbing Couplings - As a result of flexible plastic members connecting their hubs, these couplings dampen vibrations and shock loads and electrically insulate shafting. Sizes : 3/16" to 5/8"
Torque Range:48 in.-oz. - 640 in.-oz. Range of Max. Para. Misalign. : .094" to .125"
HM Manufacturing Oldham Couplings are a class of coupling called Misalignment Couplings - The sliding center elements of these couplings compensate for lateral and angular misalignment caused by tolerance buildup or as a result of mounting. Sizes : 1/8" to 5/8"
Torque Range: 16 in.-oz.-3200 in.-oz. Range of Max. Para. Misalign. : .030" to .200"
HM Manufacturing Universal Joint Couplings are a class of coupling called High Misalignment Couplings - These couplings allow the designer to have shafts that are intentionally offset, laterally or angularly, by a large amount. Sizes : 1/8" to 1/2"
Torque Range: 11 in.-oz. - 4,240 in.-oz. Range of Max. Para..Misalign. : 0 to .610"
HM Manufacturing Wafer Spring and Disc Couplings are a class of coupling called Information Transmitting Couplings - These zero backlash, high torsional rigidity couplings are for precision positioning applications where constant velocity is required for accurate feedback control. Torque Range: 18 in.-oz.-11,200 in.-oz. Range of Max. Para. Misalign. : .015" to .030"
HM Manufacturing Sleeve Couplings are a class of coupling called Information Transmitting Couplings - These zero backlash, high torsional rigidity couplings are for precision positioning applications where constant velocity is required for accurate feedback control. Torque Range: 5 in.-oz.-5833 in.-oz. Range of Max. Para. Misalign. : .0"
HM Manufacturing Neo-Flex Couplings are a class of coupling called Shock Absorbing Couplings - As a result of flexible plastic members connecting their hubs,these couplings dampen vibrations and shock loads and electrically insulate shafting. Range of Max. Para. Misalign. : .005"
HM Manufacturing Universal Lateral Couplings are a class of coupling called Misalignment Couplings - The sliding center elements of these couplings compensate for lateral and angular misalignment caused by tolerance buildup or as a result of mounting. Torque Range: 38 in.-oz. - 607 in.-oz. Range of Max. Para. Misalign. : .050"
HM Manufacturing Flex-Thane Couplings are a class of coupling called Misalignment Couplings - The sliding center elements of these couplings compensate for lateral and angular misalignment caused by tolerance buildup or as a result of mounting. Torque Range:400 in.-oz. - 3200 in.-oz. Range of Max. Para..Misalign. : .063" to 1.25"
HM Manufacturing Telescopic Universal Joint Couplings are a class of coupling called High Misalignment Couplings - These couplings allow the designer to have shafts that are intentionally offset, laterally or angularly, by a large amount. Sizes : 1/8" to 3/8"
Torque Range: 55 in.-oz. - 239 in.-oz. Range of Max. Para. Misalign. : 1.920" to .3.770"
HM Manufacturing Precision shafts come in many different types and sizes. These include inch shafting, metric shafting, and hardened stainless steel shafting. 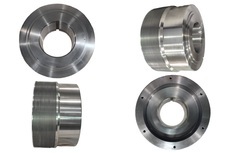 Our precision shafting is an essential component of many mechanical assemblies that incorporate our other product lines, including couplings, sprockets and pulleys.